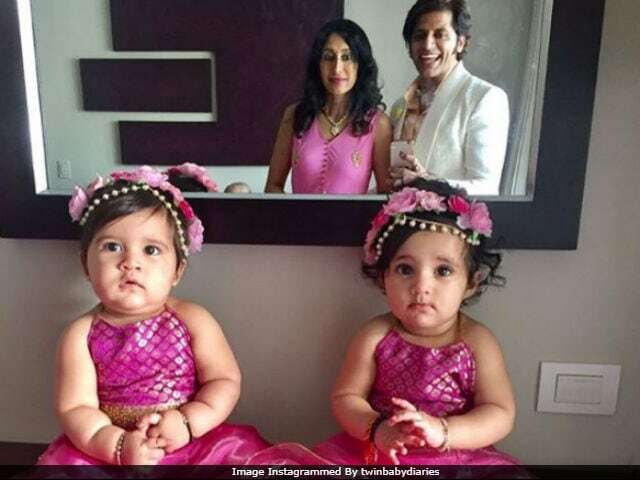 Television actor Karanvir Bohra, wife Teejay Sidhu and twins Bella and Vienna attended a family wedding in Mexico last week and the pictures are beyond adorable. Bella and Vienna, dressed in pink lehenga and matching clips, stole the limelight from their parents and were the real stars of the ceremony. (It was Teejay's brother's wedding). In one of the pictures shared by Karanvir, Bella and Vienna are seen matching their dance steps with the couple. "My babies, this is how life is going to be with Teejay and me. Full of entertainment, excitement, travel and abundance of love. We promise you the best life ever. God bless you two angel's," Karanvir captioned the post. Here are the pictures from Bella and Vienna's Mexico diaries. The baby girls also have an Instagram page dedicated to them, which is managed by Teejay. A look at their feed, will surely make your day. The Instagram page, named 'twinbabydiaries,' has over 1.5 lakh followers. Take a look at these cute pictures. Bella and Vienna were born in October last year in Vancouver, Canada, where Teejay's parents stay. Soon after returning to India, the babies got busy meeting Karanvir and Teejay's friends from the industry. Of fatherhood, Karanvir earlier told news agency IANS, "The only evolution that has happened in me is that I have become more responsible. Responsibility comes when children come into your life." Karanvir and Teejay have been married for over 10 years now. Teejay is a former model, VJ. Karanvir Bohra has been a part of television shows Shararat, Dil Se Di Dua... Saubhagyavati Bhava? and Naagin 2. He currently hosts India's Best Judwaa.